Tuesday afternoon I drove up to Leadville and rode the first part of the Leadville 100 course. I rode from the start, up the St. Kevins climb and out to the pavement at Carter summit. I then rode back and took the Boulevard back into town like finishing on race day. It had rained just before I got there so there were puddles of water and some mud. Other than being wet the course looked in normal condition. St. Kevins had some small gullies like it normally does. Tuesday night I drove up to the Leadville mining district to sleep at altitude. I found a nice level spot to park the van at 11,700 feet with a view of the Leadville lights below and crawled into the back for some sleep. I think it was raining every time I woke up during the night. There was just a little drizzle when I got up in the morning but it was still very cloudy. By the time I drove down to Twin Lakes and got ready to ride the Columbine Climb, the sun was starting to break through the clouds. With my lack of fitness and the extra weight I’m carrying, it was a slow, painful climb to the top. The sun came out nicely and I hung out at the top at the turn around for a little while enjoying the views. The upper section has recently been smoothed out and is in the best condition I’ve ever seen it. Downpours in the next couple weeks could wash it out some but I still expect it’ll be in better than normal condition. Carmichael Training Systems posted a helmet cam video of the top of the Columbine descent from their camp last weekend. I didn’t ride Powerline while I was there but Arlyn Asch posted a video of his recent ride of it. From the video, it looks like it’s in typical conditions with a few ruts to look out for. 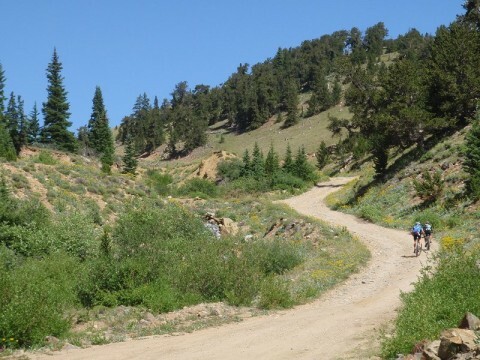 You can also read Arlyn’s write up of the rest of his Leadville 100 course preview. I saw a few other mountain bikers training for the Leadville 100. I had some nice chats with them. I saw Brian from Pikes Peak Sports riding with his friend Wade who is racing. I blew by them descending Columbine and didn’t recognize Brian. I ended up seeing them again along US 24 and giving them a ride back to their cars.